Over the past few Sundays at Hobart Baptist, we’ve been looking at what the Bible says about the Church. Although it is easy to be disillusioned by the state of the Church in Australia we’ve been reminded that the Church is God’s idea, not ours. Plus, it doesn’t belong to us, but to Jesus. Our focus has been on the need for a renewed vision of the Church not based on the hurts and experiences of the past but upon Jesus’ vision for the future. He is, after all, the builder of the Church and what we need is a radical reorientation in our thinking to see it from his point of view. The story begins when Jesus hears news of the death of John the Baptist. This must have been a sad moment for him and it seems he wanted to be alone. Instructing the disciples to get away from the crowd and take the boat to go to a quiet place to mourn in solitude. Sadly the crowd followed him and he missed out on his quiet moment. 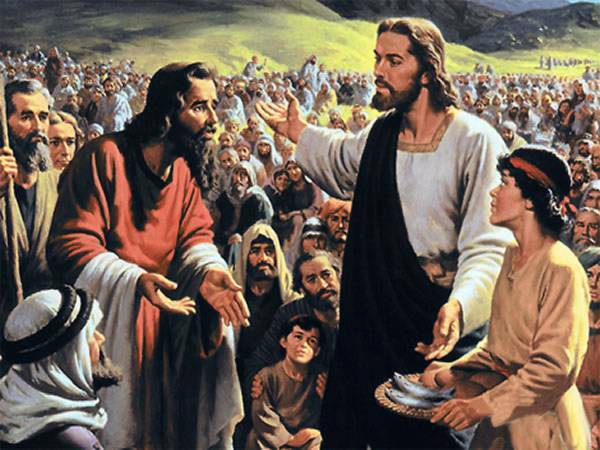 Jesus begins to teach and heal many and as the end of the day approaches Jesus asks Philip where they can buy enough bread for the people to eat. Philip is pretty pessimistic and explains how it would cost a month’s salary to feed them all. The disciples are no better, suggesting the best thing to do is to send everyone out into the countryside to find whatever they could. After witnessing all the miracles Jesus had already performed it is surprising they don’t give a thought about what he could do in this situation. little fish. Yet, Jesus takes what they found and begins to pray. Having prayed he begins to break off bits of bread and keeps breaking until there is enough for everyone to have a meal. The estimates are that there were about 5,000 men present plus women and children. It is a great story and there is plenty to learn from it. When the people are hungry and worried Jesus instructs them to relax and sit down. Then he takes what they already have amongst them, just five loaves and two fish, and multiplies it so there is enough for all. So how does this relate to the church? The story is a good reminder that when we worry about the Church and its future, Jesus’ instruction is to relax and rest in his ability to provide. When we are feeling low on resources and energy, Jesus is able to take the small portion we have and multiply it so all can be feed. What is surprising is that Jesus gives the bread to the disciples to distribute. These are the same people who had only moments earlier suggested the best option was to send people away. It is good to know that that God will use us, even if we have been some of harshest critics or pessimists. God is willing to draw us all into his work. The grace and compassion Jesus showed to the crowd is the same grace and compassion he showed his disciples who weren’t able to anticipate that he would do something special. Jesus doesn’t panic. Rather than focussing on what was missing, as the disciples did, he focused on what was available. When it comes to the future of the Church and Hobart Baptist Church in particular, Jesus doesn’t view us for what we don’t have in the way of resources and people, rather he see what is already here and is ready and able to use that. He doesn’t scold us when we struggle with unbelief, a lack of trust or creativity; rather he enlists us as part of his workforce to get the job done. No local church is perfect and we all have obvious needs; and while we might believe we have every good reason to give up on the Church; the reality is that Jesus has not. Despite the significant challenges ahead of us, the story of the feeding of the five thousand reminds us there are many way to look at the situation. When it comes to the Church today there is no need to give up. In fact, we can take courage that Jesus is with us and we can look to him to provide the solution. In fact, he is the only one who can. Let us pray that Jesus will, just like he did on that day, multiply his work amongst us. Praise God!!! I agree with you, and will pray for God’s movement through your church! We serve a mighty and gracious God! I have visions of God moving mightily very very soon and I see his awesome movement sustaining for a long time! It’s going to be such a wonderful time! Previous PostPrevious Boldness and Courage!